2014 vinyl repress, originally released in 2009. Clovis Goux and Guillaume Sorge aka Dirty Sound System have been releasing selections of rare, little-known, and hard-to-find recordings which function somewhat like anti-playlists since 2003. Their compilations can be listened to from start to finish, the order of the tracklist is logical, and the selected songs lend themselves to repeated listening. After the series Dirty Diamonds, two compilations of Dirty Edits played by the world's most influential DJs, the creation of a regularly updated blog, Alainfinkielkrautrock (www.alainfinkielkrautrock.com), and a space disco CD that prefigures the general craze surrounding the genre, Dirty Sound System is back. 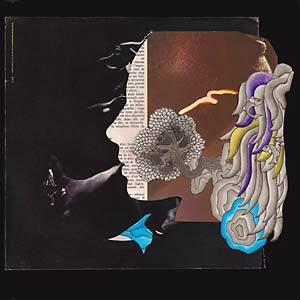 On paper, Dirty French Psychedelics is a compilation for classic rock radio with names our parents would recognize. In reality, it is a hallucinated voyage through the land of French pop psychedelics to be listened to in one sitting, eyes half-open in the heat of the summer of 2009. Certain experts will tell you that Bernard Lavilliers and Brigitte Fontaine are not psychedelic, and they are probably right. Who cares? Dirty French Psychedelics is intended for fans of French pop from Serge Gainsbourg to Air, for people who want to discover or rediscover the music of the '70s, for those who want to listen to music without really paying attention and for those who want to listen attentively through their headphones. What happened in France at the beginning of the 1970s? The hippie venture terminated in a bloodbath in 1969 (a horrendous year: Altamont and the murder of Sharon Tate), heroin replaces LSD and the survivors aren't long for this world. 146 kids die in a nightclub fire in Saint-Laurent-du-Pont. De Gaulle in his bed: "Tragic ball at Colombey: 1 Dead". In primitive black and white, Jean Eustache's La maman et la putain buries a generation that lost its bearings (a possible definition of psychedelics). It is the same year as the oil price shock. The longest solar eclipse of the century (6 min 20 s) forecasts future oil slicks. God is dead, Marx suffers, a Maoist commando attacks a Fauchon grocer. Dirty French Psychedelics is a subjective vision of this disoriented period. Instead of the France of experiences (Gong, Alpes, Magma, and so forth), this compilation prefers the France of the freelancers (Dashiell Hedayat, Alain Kan), the master-singers (Christophe, Nino Ferrer, Brigitte Fontaine), the composers (Karl-Heinz Schäfer, François de Roubaix, Jean-Claude Vannier), the anomaly among "the variety" rather than the norm in "the margins." Other artists include: Cortex, Jean-Jacques Dexter, and Ilous & Decuyper.